AAAAAAAAAAAAA… BOOM: Serious Sam was always about using whatever comes towards you for target practice and this time it's no different. Fight through giant hordes of relentless foes, both those that defined the franchise like Kamikaze and Kleer and those ready to become iconic in the future. Bigger, badder, better: Fight and explore your way through huge environments populated with optional objectives, secrets and deadly ambushes. But, fear not! Serious Sam 4: Planet Badass is still a focused, linear experience you have come to love, and NOT an open-world game. Wroom, wroom: Traversing big environments is no easy task. So get your driving skills ready and jump on a motorcycle, a combine or even a bulletproof popemobile and drive your way through unfortunate enemy pedestrians. This time, Sam's bringing friends: Companions no longer appear only in cut-scenes, but are taking part in the action. Rodriguez, Jones, Hellfire and the rest of the crew are joining Sam in this epic journey through Planet Badass. 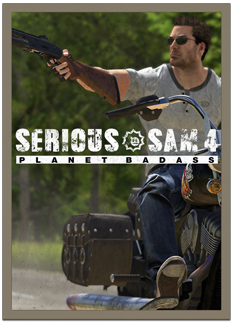 Developed by true shooter veterans in Croteam, Serious Sam 4: Planet Badass reignites the classic series by improving on the old-school formula. Enjoy the high-adrenaline action combat with an unbelievably destructible arsenal and experience Sam’s iconic enemy-annihilating circle-strafing and backpedaling dance-routine on an even bigger scale.